Friends is the biggest sitcom to ever hit our TV screens – and it is as funny today as it was back then. So, we at The List Love thought we’d share 10 Friends facts that we think all fans should know. Imagine Friends without Rachel and Ross’s on-and-off again relationship. Well, it very nearly never existed as Monica and Joey were originally planned to be the show’s main couple. Weird, we know! Can you imagine anyone other than Lisa Kudrow playing Phoebe Buffay? How about Ellen DeGeneres? She was originally offered the role but turned it down. You couldn’t help but fall in love with Chandler and Monica’s relationship when they got together at Ross’s wedding in London. However, the romance might never have happened if the writers went with their plan of making Chandler gay. The Friends theme song is synonymous with the show. Would it have been such a success if they’d used the original choice, ‘Shiny Happy People’ by REM? Luckily, the producers of the show, Marta Kauffman and David Crane, co-wrote the theme with The Rembrandts. Ross Geller was the only character written with the actual actor in mind for the part. All the other actors had to audition for their roles. 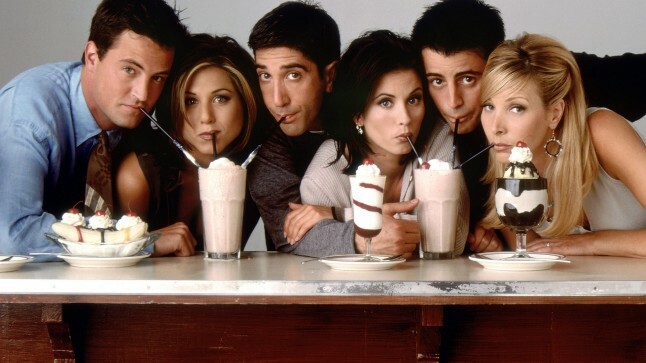 Before filming each episode, the six Friends actors would have a private backstage huddle, and they also refused to let anyone else or cameras into the room. Courtney Cox was originally asked to play Rachel, but she turned down the role, stating she was more Monica. It looks like she was right! Marcel was Ross’s loveable pet monkey, but did you know the cute little animal is actually female and her name is Katie. The Big White Dog in Chandler and Joey’s apartment actually belongs to Jennifer Aniston, as her friend gave it to her as a good luck gift when she landed the role of Rachel. We’d give it away, too! Remember Joshua? The guy that Rachel was obsessed with? His father in the show is actually Matthew Perry’s real-life dad. Have you got any Friends fact you’d like to share? We’d love to hear them. You should also check out our previous article 10 Mindboggling Disney Crossovers.